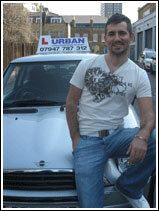 "Urban has a great reputation and rightfully so"
Matt Gascoigne, passed second time, May 2006 at Barnet. If you have a query about Urban or a general enquiry, you can contact us by email or phone and our team will be happy to help you. You can contact us via the email link provided to the right. Should your query not be resolved via email or you would simply prefer to contact us by phone, you can contact us on 07947 787 312. PLEASE NOTE: EMAILS WITH NON-VALID EMAIL ADDRESSES WILL BE IGNORED.